1 Track London Records Promo CD with an edit of the K-Klass 'Reunited In A Day' remix. The Edit was never released commercially and remains a promo only track. The CD is housed in the standard UK CD sleeve for Ruined In A Day (NUOCD02), listing the 4 commercially released tracks; there is no reference NOMIXDJ 2 or this edit except on the sticker and disk itself. 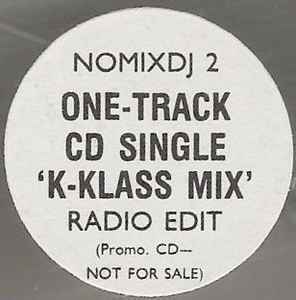 Sticker reads: 'K-Klass Mix' Radio Edit.